Kevin James is about to get slimed. 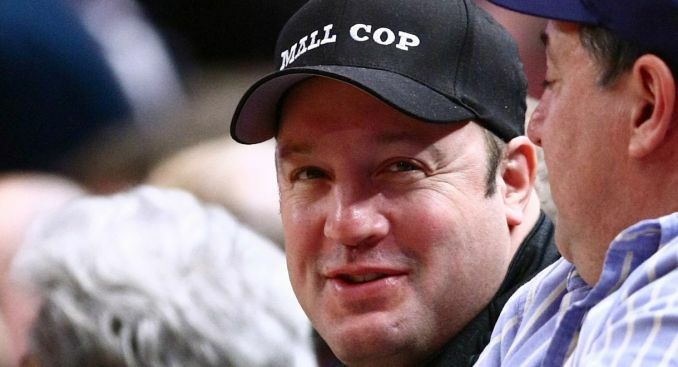 The "Paul Blart" star has been tapped to host the 2010 Nickelodeon Kids' Choice Awards, airing live from UCLA's Pauley Pavilion on Saturday, March 27. "I have been lucky enough to live more than my share of dreams — a hit TV show, a hit movie, a beautiful family, and, of course, that prize-winning watermelon I grew last summer," said James. "Yet throughout it all, I've had this nagging feeling that my journey wasn't complete. Oh, sure, it's been quite a ride, but it lacked something… something green, slimy, oozing, slippery and dangerous! That's right — there's been no slime… until today! In short, I guess you could say hosting the Kids' Choice Awards completes me." Vampires, monsters and robots dominated the movie categories with "The Twilight Saga: New Moon" sinking its teeth into five nominations for Favorite Movie, Favorite Book (The Twilight Series), Taylor Lautner for Favorite Movie Actor and its "Cutest Couple" duos, Rob Pattinson/Kristen Stewart and Taylor Lautner/Kristen Stewart. "Monsters vs. Aliens" nabbed three nominations for Favorite Animated Movie and Favorite Voice in an Animated Movie (Seth Rogen, Reese Witherspoon) and "Transformers: Revenge of the Fallen" crushed with three nods for Favorite Movie, Favorite Movie Actor (Shia LaBeouf) and Favorite Movie Actress (Megan Fox). "Alvin and the Chipmunks: The Squeakquel" and "X-Men Origins: Wolverine" also got nods for Favorite Movie, while Zac Efron ("17 Again"), Tyler Perry ("Madea Goes to Jail"), Sandra Bullock ("The Proposal," "The Blind Side") and Zoe Saldana ("Avatar") compete in the Favorite Movie Actor and Favorite Movie Actress categories. Three-time Kids' Choice winner Miley Cyrus, scored four nominations: one each for Favorite TV Actress ("Hannah Montana"), Favorite Movie Actress ("Hannah Montana: The Movie"), Favorite Female Singer and Favorite Song ("Party in the USA"). Two time KCA winner Beyonce, makes the list again to compete in the Favorite Female Singer category against Miley, Lady Gaga and Taylor Swift, who are also nominated for Favorite Song. First time Kids' Choice nominees President Barack Obama and First Lady Michelle Obama will compete in the brand new category for "Cutest Couple" against "Twilight"love triangle heart throbs Rob Pattinson/Kristen Stewart and Taylor Lautner/Kristen Stewart and "Avatar" hotties Sam Worthington and Zoe Saldana. The new category was chosen last year by kids who were asked to submit their ideas for new favorites they would most like to see added to the 2010 show. Find out who wins when Nickelodeon's 23rd Annual Kids' Choice Awards airs live on Saturday, March 27 (8-9:30 PM ET/PT).